The 2767 M18 FUEL High Torque 1/2 in. Impact Wrench with Friction Ring eliminates the need to use a pneumatic tool for those stubborn and rusted bolts by delivering 1,000ft-lbs of fastening torque and 1400ft-lbs of nut-busting torque. With 2X faster removal speed, users will be able to get the job done faster and be more productive throughout their day. By providing the industry's most compact cordless High Torque Impact Wrench at 8.39 in. length, this tool allows for more access in tight spaces. 4-Mode DRIVE CONTROL with Bolt Removal mode gives users the most control over their fasteners. Bolt Removal mode gives the user more control when removing fasteners by slowing to 750rpm once the fastener has been busted loose. This tool offers quick, tool-free socket changes with a 1/2 in. friction ring anvil. A premium rubber overmold material gives you ultimate comfort during prolonged use while lasting longer against corrosive materials. 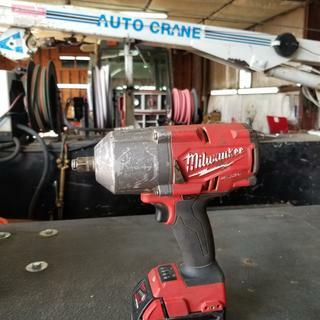 Powerful, heavy-duty tool. Strong enough for a variety of automotive tasks. We have had it for about 1 month, and we have had no issues thus far. The batteries do not seem to last long though. I work in the auto and towing industry. I use the gun to remove drive shafts and axles on tractor trailers. The gun puts out a lot of torque. One of the best features I like the most is the auto slow down when removing bolts. Other than being a little heavy seems to have good power. We also like the variable speed instead of wide open after it brakes the nuts free. Love it. I love the weight balance. I love all aspects of the tool. Although... A tighter fit between the battery and the tool would be nice. First time Milwaukee purchase, I will buy more of this brand. Loads of power removes everything that I throw at it, and the battery life is great. The quick charger took about an hr to charge a battery fully from 1 bar. Excellent impact. After having it several months and using it daily as a service technician for Case IH I would have to say it's better than anything out there. I no longer have an air powered impact and solely use this. I work out of a service truck most of the time and its nice not dragging hoses around. Just used it today to remove the rusted on 1 1/2" nuts on a grain truck suspension. Snap On cordless and air wouldn't budge them. I don't care that its heavy. Does to much work to be worried about that. The only time battery life suffers is if you do a lot of hard impacting. Most days I can use it off and on all day and never switch batteries. This is with 5.0 ah. It gets heavy after a few uses, and the wrench is hard to use in enclosed area, other then that it's great. I like the rugged and ease of use. Heavy but a must to have. I own a car repair shop, I use it every day I like it. The problem I have not been satisfied is that it's a bit heavy, holding it long will tire hands. BEST ANSWER: The Fastening Torque is 1000 ft.-lbs. The Nut Busting Torque will be 1400 ft. - lbs.